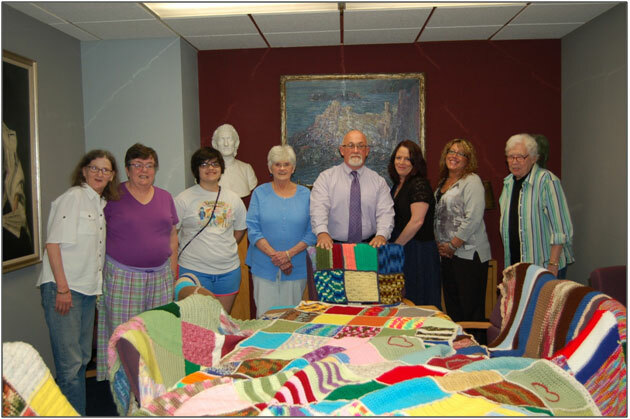 Steele Library has a Knit and Crochet Club that began in 2012. They meet every Wednesday from 12:30-2:00pm in the small meeting room to share their projects, good conversation, and to learn from one another. Any adult is welcome to join the group. If you don’t know how to knit or crochet, the members are willing to teach you. Since 2013, they’ve been sharing their talents with the community by making and collecting knitted and crocheted pieces for use in creating afghans and lap robes. They’ve been able to put together over a dozen afghans and lap robes so far which have been donated to Second Place East and the VA Hospital in Bath. Their next project will be sent to the Safehouse. After that, they will work on pet rugs for the animal shelter. If you are a yarn crafter and would like to make pieces to donate, they would greatly appreciate it. They can be any color or design but they have to be 7 X 9 inches in size. There is a box at the library’s checkout desk to collect the pieces. Club members would like to publicly thank Ann O’Brien who has donated many lap robes and others who are dropping off pieces, especially the unknown woman who donates on a weekly basis. They’ve all been used. Thanks to the CCLD Knit and Crochet Club, others in Chemung County are staying warm this winter. For more information about the club and their projects, call Lucy at 733-3677.